regulated electrical switches and other new technologies. and continuously adjustable pressure. What’s more, the thermal efficiency is over 80% and more than 30% energy saving than ordinary rice cooker, which means save time and electricity. Electric pressure cooker is indeed a much more practical cooking utensils than others. It is leading us to a much safer, more convenience century due to the fast and multi-function cook ways. Our company has over 10 years in supplier& exporter experience, and our products are heavy demandin China and the other foreign country. 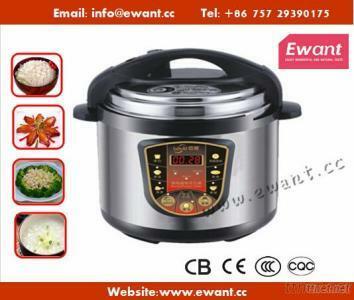 We are specializing in ELECTRIC PRESSURE COOKER, MINI RICE COOKER, ICE MACHINE. Our product are enjoyed great popularity in China and the foreign country. Their high quality and reasonable price will let you believe that they are really value.